Supercomputers Assist Firefighters As Wildfires Spread In California New technology builds on existing models and adds in the growing amount of real-time data available from NASA satellites, weather stations, field cameras and aerial reconnaissance flights. 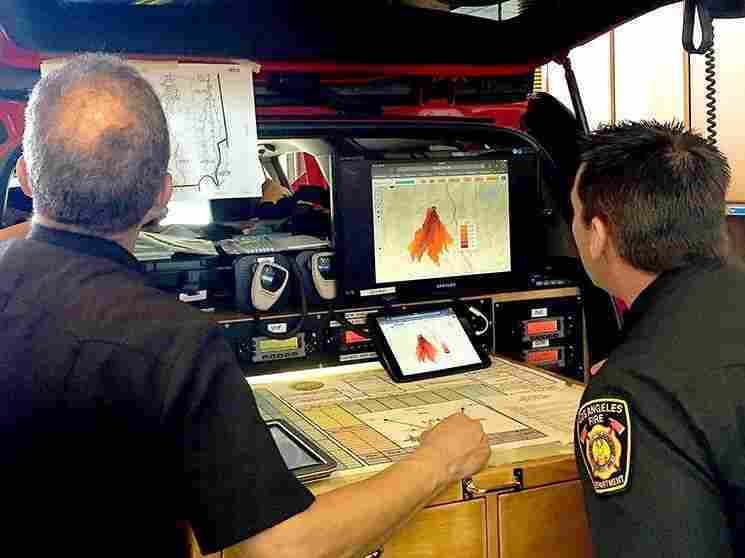 Los Angeles Fire Department staff look at a new fire prediction tool, powered by supercomputers. The deadly blazes burning in California have put a spotlight on the crucial role of evacuation. In the moments after a wildfire begins, firefighters must predict where a fire will spread to save lives. Now, California firefighters are getting some help from a powerful new tool: supercomputers. Computer servers, crunching real-time data from satellites and weather stations, are providing forecasts of how wildfires could behave in the next few hours. Those predictions could help fire agencies add crucial minutes to evacuation orders. The Camp Fire spread at a terrifying speed, like other recent fires fanned by extreme weather and a warming climate. "The abnormal is the new normal," says Jonathan Cox, division chief with Cal Fire. "It's something that 30-year firefighters have never seen." 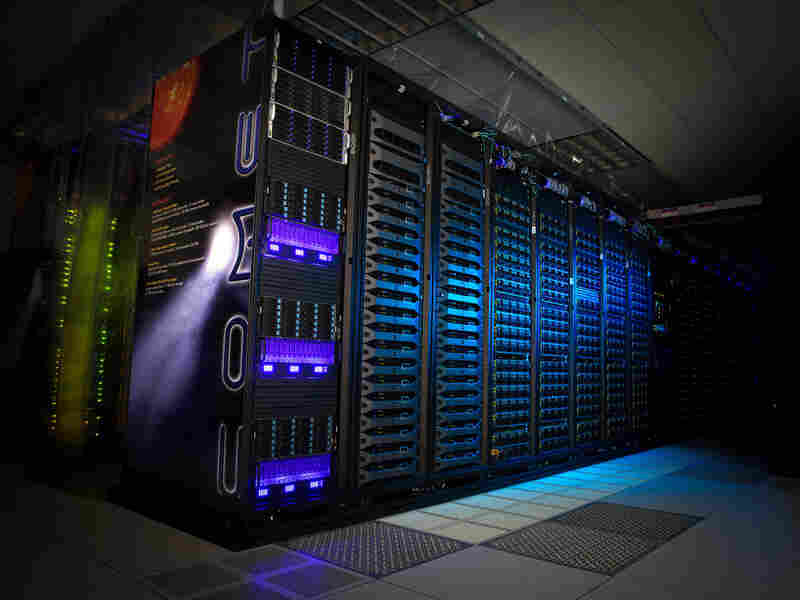 The Comet supercomputer at the center at the University of California, San Diego, has a computing speed of 2.76 petaflops, or about 2 million smartphones. Today, fire agencies predict how a fire will move by looking at the weather, terrain and fuel moisture, as well as by relying on the decades of experience of fire analysts. "This is an inexact science that is having to be done during the middle of an emergency," says Cox. "So it can be extremely difficult to get a really precise idea of where a fire is going." Many fire agencies also use basic software on laptops that can produce projections of the fire. Such tools have been available for about a decade. But in recent years, the availability of real-time fire data has ballooned. NASA satellites are providing detailed images of fire perimeters. Weather station, field cameras and aerial reconnaissance flights provide even more. For that kind of data, a supercomputer can be a big help. "Our current supercomputer is called Comet," says Ilkay Altintas of the San Diego Supercomputer Center at the University of California, San Diego. "Comet is 2.76 petaflops." That's about the same processing speed as 2 million smartphones. The supercomputer center has developed WIFIRE, a fire behavior model that builds on existing models and adds in real-time data. It can run many simulations simultaneously, as soon as a fire breaks out. "We can understand where the fire will be, its rate of spread, its direction for the next couple of hours," Altintas says. "Having that information in a matter of minutes, in your hand, as fast as possible, is very important." Cal Fire has been getting the supercomputer forecasts for the Woolsey Fire in Southern California. The agency says it's still being used experimentally, but it's part of a growing trend of more technology in firefighting. "The more information we can get and decisions we can make based on technology is obviously the future," Cox says. Still, he doesn't think machines will take the place of human judgment. "It's one more way that we can make decisions, but I don't think it will ever replace the human factor because of the dynamics that come with these fires," he says. There are some wildfires that today's computer models can't predict well: the ones that create their own weather. California firefighters saw this back in July, battling the Carr Fire near Redding. It was "unpredictable," according to Cal Fire, spreading erratically. It also produced a massive "fire tornado" with winds of over 160 miles per hour and claimed the life of fire inspector Jeremy Stoke of the Redding Fire Department. "We've seen a lot of fires that are driven primarily by these winds that are created by the fire itself," says Janice Coen, a project scientist at the National Center for Atmospheric Research in Colorado. In these "plume-dominated" fires, fire-created winds propel the blaze forward. Those winds can top 50 miles per hour, even though the winds outside may be much weaker. Current fire behavior models don't account for that in their forecasts. "In some of the most destructive, most important cases, they come up short," Coen says. Coen is working on a computer model that simulates fire-driven weather, known as CAWFE, or the coupled atmosphere wildland fire environment. She says it has shown promise, but the hard part is rolling it out to fire agencies, because adopting new technology is risky for them. "It's difficult to integrate new technology in firefighting in particular," she says. The potential, she says, is that communities in fire-prone areas will be a bit safer. "I have a lot of hope that we'll be able to understand fires and anticipate their behavior so that we can learn from it and avoid more catastrophes in the future," she says.